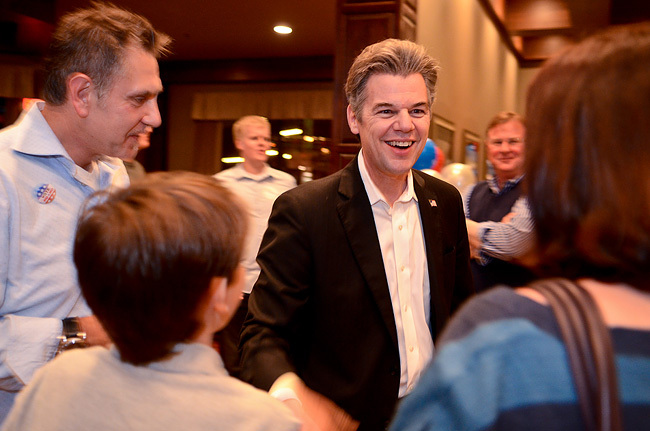 Jim Graves’ exit from the congressional race in the 6th District was certainly a stunner today. Given the makeup of the district and the impressive number of Republicans willing to take Michele Bachmann’s place, it’s debatable whether he would’ve gotten anywhere near as close to a congressional seat as he did when he lost his bid last November. Still, the polls had him ahead of Bachmann. It’s hard to begrudge anyone not wanting to lose their fortune trying to win a congressional seat and when Bachmann said “no mas” this week, there’s a fair chance a lot of money that would’ve flowed into Minnesota to defeat her went away. With Bachman out of the race, the campaign wouldn’t have gotten anywhere near the media attention and it might’ve been harder to frame the debate on important issues. All of that is logical thinking for a candidate who doesn’t want to run. The problem is: Graves didn’t use any of that logic in his announcement, and he shied away from being asked any questions by delivering a press release rather than standing up before a room full of reporters with good questions needing logical answers. The fact both he and Bachmann made their announcements without facing questioners is delicious irony in itself. People with a chance to win who quit in politics get a special place in the political cemetery because they quit on all of the things they said they stood for when they ran for office. By saying his “mission was accomplished” in allegedly forcing Bachmann from the race, Graves suggested that his mission wasn’t standing for any of the things he said he stood for; it was about getting payback. Maybe it was a convenient excuse to get out of the race. We don’t know. As of April, Graves had hauled in over $100,000 from people who either (a) just wanted to get rid of Michele Bachmann or (b) had an ideological relationship with what Graves stood for as a potential member of Congress. We’ll never know. It would have been tough going for Graves in any campaign against a Republican in the 6th District, probably as tough as doing something about the scandalous backlog of cases of returning military men and women at the Veteran’s Administration, or the weak economy, or the fact kids are graduating from college tens of thousands of dollars in debt with little chance of a job. Those are pretty important things, the kind of things the best and brightest politicians ever to come out of Minnesota once were willing to put up a fight for. None of those problems are the responsibility of the representative of the 6th Congressional District in Minnesota. Those are our problems. If we were focused on them, and really paid attention, we might elect candidates, Democrats or Republicans or Independents who were also focused on them. #1) The VA. Rep. Tim Walz is on the Veterans Affairs Committee. Rep. Kline could be of help, too. The buck stops with the President. So lets call them, and insist on action. #2) Okay, private sector, this one is on you. Time to put up the “help wanted” signs, businesses. Lord knows your profits are up. Time to hire, and get this country working again. #3) We all have some blame to share here. First, students, you have to find a way to limit your debt. Find a smarter way to get smarter. Second, schools, your costs are through the roof. Do something about it, or we will. Third: Lenders, stop taking advantage of students, or we will shut you down. Last warning. Our political leaders won’t get smarter or better or more focused until we do. Until then, we get the government we deserve. Or maybe Graves is just acknowledging that the 6CD is reliably Republican, and that with a crowded Republican primary field, a sane candidate may emerge. Bachmann was/is an embarrassment to the state, and Graves’ race against her was more a matter of civic duty than personal ambition. As for your quitting argument, it seems to be predicated on a belief that no Republican candidate would ever take care of the veterans of Bush’s wars, or fund education. It’s hard for me not to see you as being the real cynic here, Bob. I’m not saying I disagree with you, but my opinion of Jim Graves has not changed. He stood up to a liar and braggart, and now that she’s stepping down, well … mission accomplished! // Our political leaders won’t get smarter or better or more focused until we do. Until then, we get the government we deserve. But, Bob, it’s a shellgame. Voters have nothing — really — more to go on when it comes to bestowing faith than the word of a politicians. If a person is running to help solve problem A, B, and C….and people support that with their campaign time or their dollars, that’s how people get involved. so if someone that says, “Hey, I quit, and also I was never about that stuff….” I’m not what a reasonable person is supposed to do. After awhile, it’s all just Lucy holding the football. // Or maybe Graves is just acknowledging that the 6CD is reliably Republican, and that with a crowded Republican primary field, a sane candidate may emerge. Maybe. But I don’t see how that’s a healthy democratic process. First of all, it deprives voters of a chance to really vett a candidate by seeing how they stand up to a challenge. Now, maybe the Republicans will vett themselves or maybe they’ll just decide — as often happens — to cut a deal for the one candidate. I don’t see how denying the voters the opportunity to watch a candidate campaign benefits anybody but the political class. Last time I checked, THAT’S the “automatic re-election” system that everybody professes to hate. If Jim Graves’ job was simply to get rid of Michelle Bachmann then why not just run a campaign now that says ” I’m in to force Michele Bachmann out of the race and once she’s out I’m out.” But that wasn’t what he said and two days ago his campaign was still calling people looking for money, CLEARLY indicating he was running for office. For a lot of people, politics is nothing more than a game… a strategy.. a chess match. Nothing any different than sports. In this case, it’s all about the winning. Not the doing. Not exactly the second coming of Wellstone. I don’t know; it seemed obvious to me that Graves was running to defeat Bachmann more than anything else. As such, with his main objective fulfilled, and the fact that the race probably would have been harder with her not in it (for the reasons that have already been mentioned), his actions don’t surprise me. Idealistic? No, but certainly practical, and savvy businesspeople know not to throw good money (and time) after bad. Did you only feel that Bachman decided not to run for re-election, or same question for Graves? if so I guess that’s some fine washington post journalism. And think, this is a guy who WANTS to be a congressman. That’s true when it comes to Mr. Graves, who has never held public office. But Bachmann had a track record, which you covered well in your recent “By the numbers” post. Yet my district kept re-electing her. That’s all history now, and in a year and half from now, I’ll have a new Representative. I don’t know who it will be, but it won’t be Bachmann or Graves. // . Yet my district kept re-electing her. Which they had every right to do. Hmmm. The little bubble at the top of the page says 9 comments, but all I can see is one other one….. Comment counter says 9 have been logged for this article. None are visible no matter what pathway I use — click on the headline link to open the article in a single page, click on the Read More link, click on the comment counter itself. They all take me to the page to read/add comments, but don’t display any. If I click on the Newest or Community links on the comment page itself,only MrE85’s “test, test” comment displays… but that comment displays on all three stories I tried, new and old. Technical details: Laptop running IE and a Windows platform, not signed in via any of the communities, Julia Schrenkler is en route to Alaska WTH? The comments will come in time, it takes a while to bring over the magnitude of comments generated over the last 6 years. The system knows there are comments there but it takes time for the comments to arrive for viewing. Bob posted about the blog change previously – click the link to read his take on it. Open election will bring lots of fun action! PS really dislike the new look. 1995 called and wants it’s large font back. Hm, yeah it is much more readable if I press CTRL- at least once or twice (Firefox). Once being probably easier on the eyes (thinking of eye strain), but twice being about the same amount of content in the same space as before (slightly larger/less) but with an easier to read font.